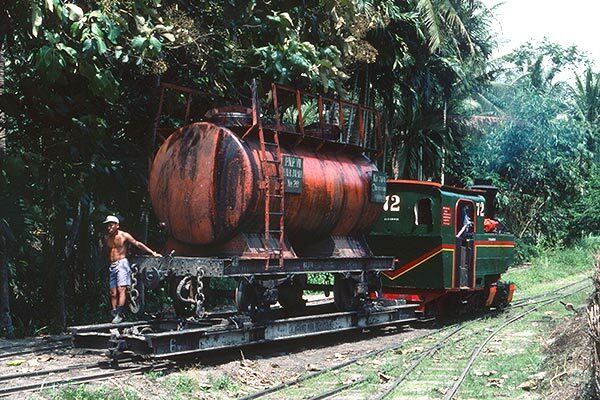 Caption - Dolok Sinumbah Palm Oil Estate on the island of Sumatra (Indonesia) had an extensive 70 cm gauge railways system which connected with the 3-foot 6-inch PNKA mainline at Perlanaan. Unusual outside of Europe, transporter wagons were used to ship mainline wagons to and from the Oil Mill. Here 0-4-4-0T Mallet no.72 takes an oil tanker back to the mill in August 1982. Built by Ducroo & Brauns (165/1928), no.72 was, like all the locos at this mill, in excellent condition.